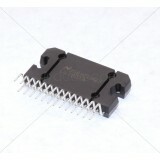 An integrated circuit or monolithic integrated circuit (also referred to as an IC, a chip, or a microchip) is a set of electronic circuits on one small plate ("chip") of semiconductor material, normally silicon. This can be made much smaller than a discrete circuit made from independent components. C1237HA - Speaker Protection IC for Stereo Power AMP Overview: C1237HA is a monolithic integra.. Microchip - Digital Potentiometer ICs 50k U/D single 6-bit NV POT Overview: The MCP4021/2/3/4 ..
NJR - NJM4556AV-TE1 - Op Amps Dual High Current Overview: The NJM4556A integrated circuit is a..
STMicroelectronics - TDA7468D13TR - Multimedia Digitally Controled Audio Processor Overview: T..
TAS5630 (DKD Package) - Analog input 300W Stereo class D amplifier IC Description: The TAS5630..
TAS5630 (PHD Package) - Analog input 300W Stereo class D amplifier IC Description: The TAS5630..
Texas Instruments - LM317 - 3 Pin 1.5A Adjustable Positive Voltage Regulator Description: The ..
Texas Instruments - LM337 - 3 Pin 1.5A Adjustable Negative Voltage Regulator Description: The ..
Texas Instruments - LM338 - 3 Pin 5A Adjustable Positive Voltage Regulator Description: The LM..
Texas Instruments - LM350 - 3 Pin 3A Adjustable Positive Voltage Regulator Description: The LM..
Texas Instruments - SoundPlus(TM) High Performance Audio Operational Amplifiers OPA2134UA/2K5 Des..